Customized to your install, our Web and Mobile based management software FUSE sets us apart from a traditional provider. 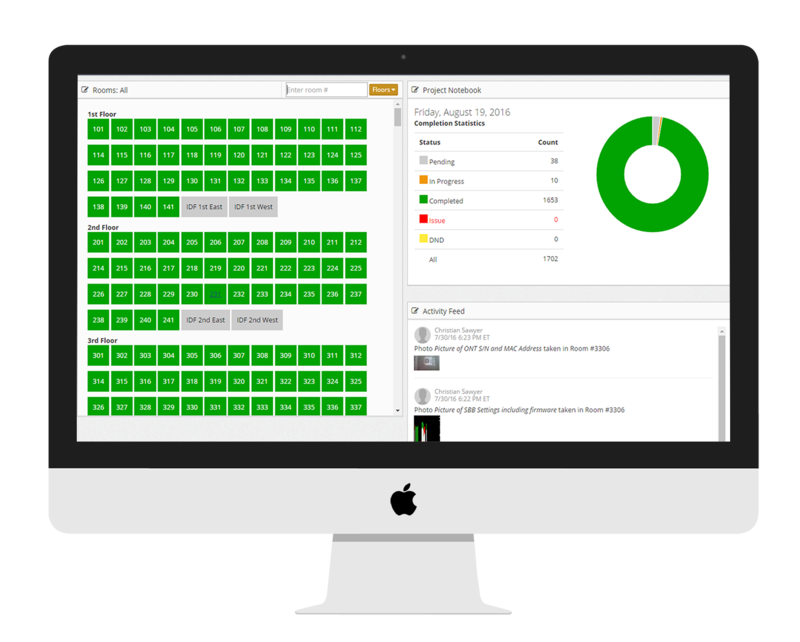 This personalization allows us to enforce and track completion of all required tasks specific to your system speciﬁcations providing real-time status on the installation progress. Your front desk and management team, via any web browser, will be able to know which rooms our technicians are in and which rooms are complete in real time. Plus, have the ability to message the tech and team lead and track any customer issues after the room completion. With unique asset tracking capabilities, we’re able to catalog detailed speciﬁcations of all equipment and cabling throughout your establishment which will in turn significantly reduce future down time issues. Additionally, our application can capture detailed notes that serve as invaluable tools for post-install and ongoing maintenance needs. Thinking of IoT in the future? The details are all captured lowering costs for any future IoT deployment. This isn’t a one size fits all application with a spot for all possible information yet none you actually need, it’s specific to your requirements so that every process is managed. Every asset tracked and quality recorded. FUSE is not electronic paper! Skeuomorph ( mimicking the physical word) was great for a time, but people understand the electronic world now and your process can take advantage of the efficiencies the electronic world offers without adding the inefficiencies of the paper world back in.